Ben Chin is running to be Mayor of Lewiston, Maine. The election is December 12, 2017. LEWISTON – Two leaked emails from a Chin campaign insider concerned about the direction of the campaign offer an inside look into Ben Chin’s opinion of voters he marks as “other” in his daily campaign report to his team, and shed light on his position change on the Lewiston/Auburn merger proposal that was on the ballot in November. 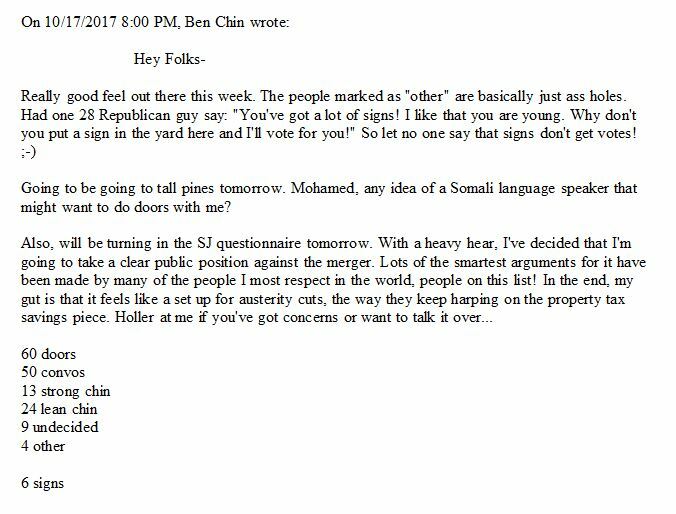 While the number of voters Chin labels as “assholes” in these two emails is just a few, it is important to note that in other emails leaked to Maine Examiner, Chin often identified voters in the same manner throughout the course of his campaign. One of the emails also sheds light on Chin’s Lewiston-Auburn merger positions, where Chin writes to his campaign team that the talk of cost-savings causes him to worry that spending cuts will ensue. He points to discussion around merger supporters “harping” on property tax savings as the reason his gut tells him to take a position to oppose the merger. Other leaked emails released by Maine Examiner have shown Chin mocking Lewiston voters who complain about their property taxes and joking with a member of his campaign about making voters beg for Chin to raise their property taxes. Maine Examiner has provided screenshots of both new leaked emails at the end of this post. 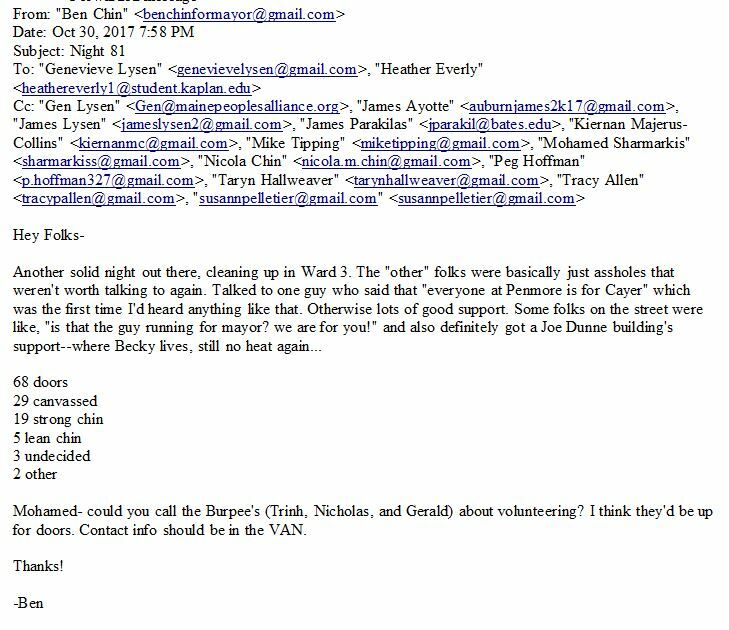 These leaked emails are the latest in a stream of leaks from a campaign insider that began about a week ago. Chin hopes to win the election to replace Mayor Bob MacDonald this coming Tuesday, December 12th. Chin, the political director of the Maine People’s Alliance and an Augusta lobbyist, faces Shane Bouchard, a Lewiston native and small business owner, who serves on the Lewiston City Council to replace MacDonald as Mayor of Lewiston.